Somebody's been reading her Stephen King. 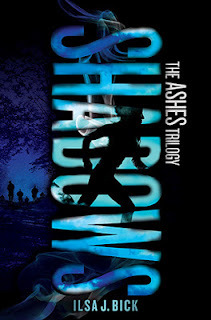 Ilsa J. Bick's follow up to Ashes has been highly anticipated, and for the most part, was worth the wait. If you thought that the first book was dark, Shadows is going to surprise you. The world is still a mess after an electromagnetic pulse has changed most teenagers into cannibalistic zombies. Shadows jumps right into the action, where we learn that the Changed are becoming more organized and adept. The descriptions of the Changed are far more graphic--from their constant mating habits to their penchant for wearing the tattooed skin of their victims as bandannas. Our heroes are the same people, Alex and Tom, yet they have been changed irrevocably. Bick's frequent shifts in narration and gory details remind me of Stephen King in the best possible way. I love that I never can tell if a character is becoming a Changed, or if they are just weary, starving, and stressed. Shadows isn't as tight as Ashes. There were a few incidences when my eyes glazed over due to descriptions of old mines and days in Vietnam. I also wanted a cliffhanger that would leave me hungry for the third in the trilogy. Perhaps it's a bit much to ask, although some editing could have given me just that. I'm excited for the final installment of the series, if only to see how much more bleak Bick will make things.